It’s still fall, but the air has turned colder and the evenings have gotten darker. 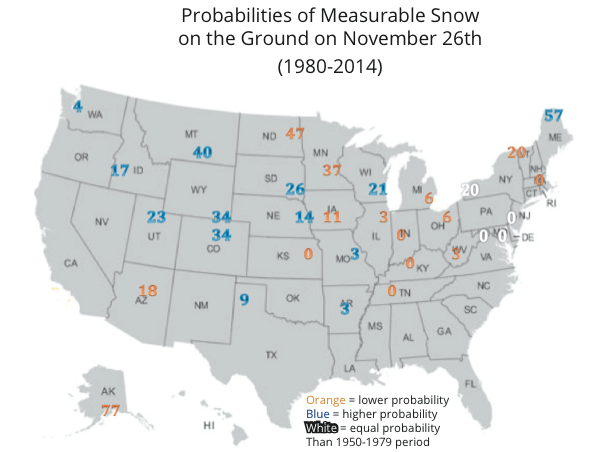 Will you see snow on the ground for Thanksgiving? Based on historical data from 1980-2014, most areas have a low probability of seeing a white Thanksgiving. The highest chance on the map is Anchorage, AK with 77%. That’s down from a 93% probability during the 1950-1979 time period. 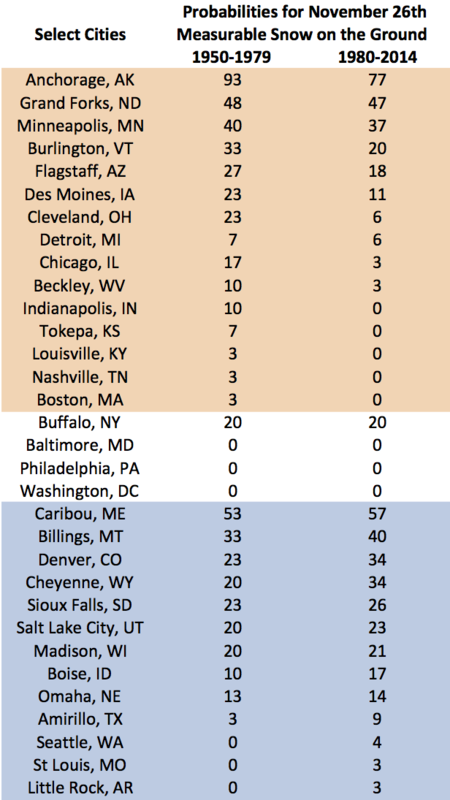 Other cities in orange on the map have also seen a decrease between these two time periods. Cities in blue have a higher probability in the 1980-2014 time period. A comparison of snow cover probabilities for two different periods. Current snow & ice condition provided by the NOAA, U.S. National Ice Center. 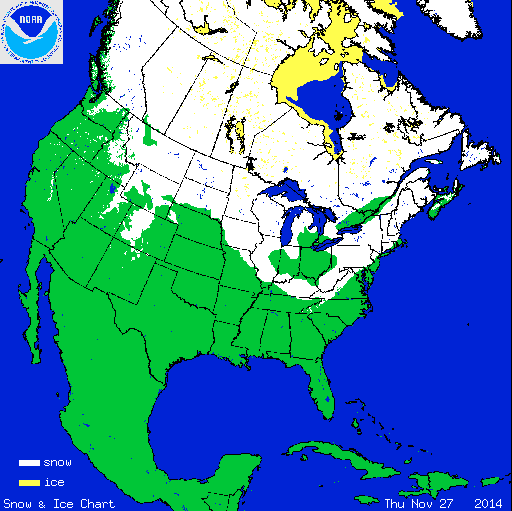 Thanksgiving 2014 snow & ice condition provided by the NOAA, U.S. National Ice Center. These maps use data from multiple sensors including satellite and radar. Currently there is snow cover in the mountainous areas of the western US as well as the Great Lakes region. 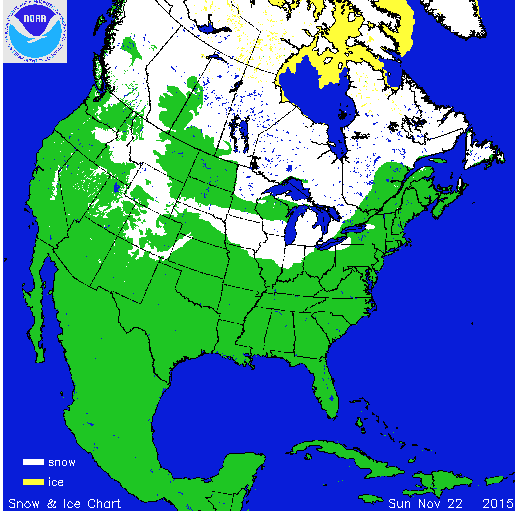 Last Thanksgiving a large portion of the northern US had snow on the ground. November 2014 was a snowy month for the Northeast as 23 of the 35 airport climate sites were snowier than normal. The outlook shows increased chances for above normal temperatures for Alaska, southern plains to the Great Lakes and northeast US. 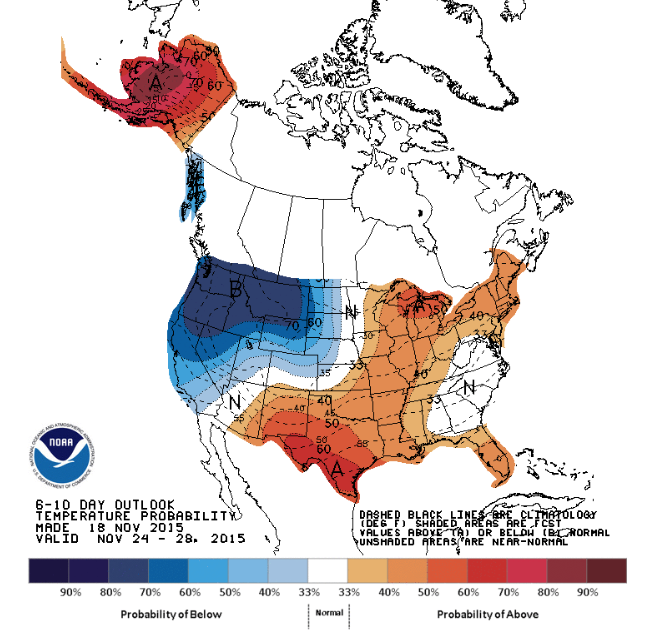 Below normal temperatures are predicted for much of the western US. Mountainous areas in these regions that are cold enough for snow may have a white holiday, especially those who currently have snow.